Description: The 30–35 mm flower has a cylindric corolla. Leaf: Its leaves are attached to the stems by stalks (many other Nicotiana species have sessile leaves), and its leaves and stems are neither hairy nor sticky. Notes: Nicotiana glauca, a dicot, is a tree or shrub that is not native to California; it was introduced from elsewhere and naturalized in the wild. The California Invasive Plant Council (Cal-IPC) lists plants that cause serious problems in native ecosystems. 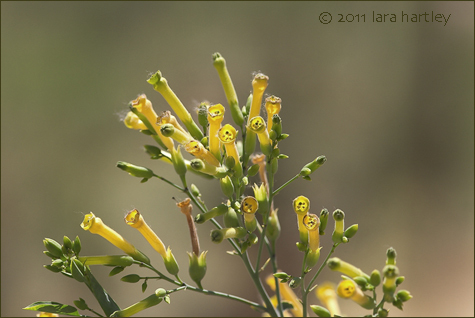 In the 2006 list, Cal-IPC classifies the statewide impact of Nicotiana glauca as moderate. Tree tobacco was introduced to California about 100 years ago and is found growing up to 5,000 feet in disturbed soils, vacant lots, along roadsides, streamsides, and other riparian areas. Distribution outside California: to s US, Mexico, Africa, Mediterranean; native to S.America. This photo was taken near Caliente, Kern County, California on June 6, 2004.